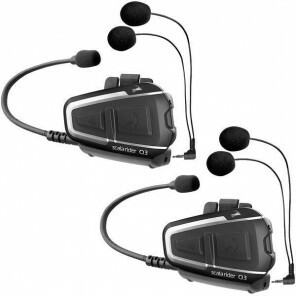 The Cardo Scala Rider Q1 is a Bluetooth headset designed for motorcyclists, to keep you safely connected whilst on the road. With the voice control technology, you can answer your mobile phone calls hands-free without needing to compromise your safety whilst travelling. And thanks to multipoint technology, you can connect two different mobile phones at the same time - ideal for those juggling a professional and a personal mobile phone. The Scala Rider Q1 is also enabled with A2DP to allow you to stream music from your mobile phone or other music player through your headset. Additionally, the Rider Q1 is able to receive GPS/Sat-Nav audio instructions to replay to you in-ear. The intelligent self-adjusting speakers can change their volume automatically, depending on your speed and ambient noise whilst on the move. This means that you can stay focused on the road, instead of worrying about increasing or decreasing the volume of your motorcycle headset. The Scala Rider Q1is waterproof and dustproof meaning it is suitable for riding in any weather, and can offer up to 10 hours talk time, or 1 week standby time. With a customizable hot-dial function, and personalisation of important features plus software updates available on-line, the Cardo Scala Rider Q1 is the ideal solution to your motorcycle communication needs. 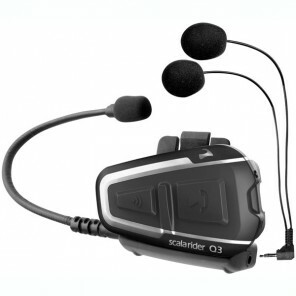 When paired with another Scala Rider Q1 headset, the two devices form a rider-to-passenger intercom, allowing free communication via Bluetooth between the two devices. Additionally, Music Sharing™ technology means that you can share music, streamed from your mobile phone, through both headsets simultaneously. The Click-to-Link™ function spontaneously forms an intercom with other Scala riders nearby, for quick and easy communication with others. With Digital Signal Processing (DSP), the Cardo Scala Rider Q1 hands-free motorcycle kit offers superior call quality, even via Bluetooth.